Ever feel the world is getting too large and things are moving too fast? 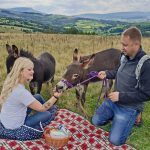 The perfect stress-busting way to slow things down is a stroll in the company of a friendly little animal and we have the perfect little guys to spend a happy few hours with in the beautiful surroundings of the Brecon Beacons. 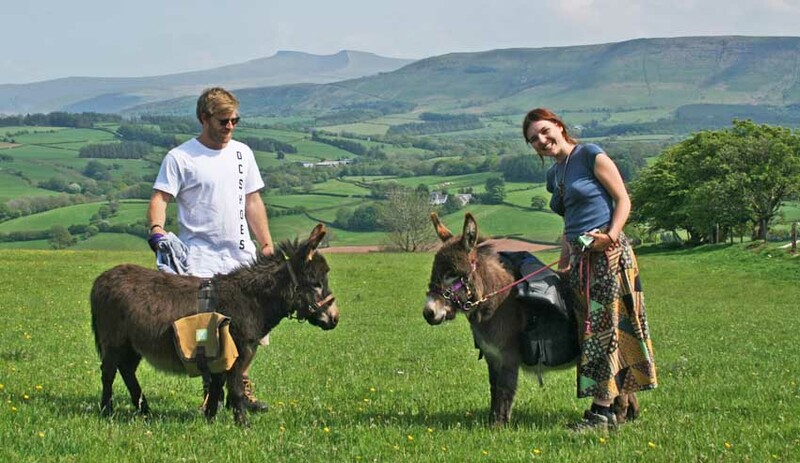 Good Day Out’s newest recruits are a pair of little Miniature Mediterranean Donkeys called Maverick and Goose. 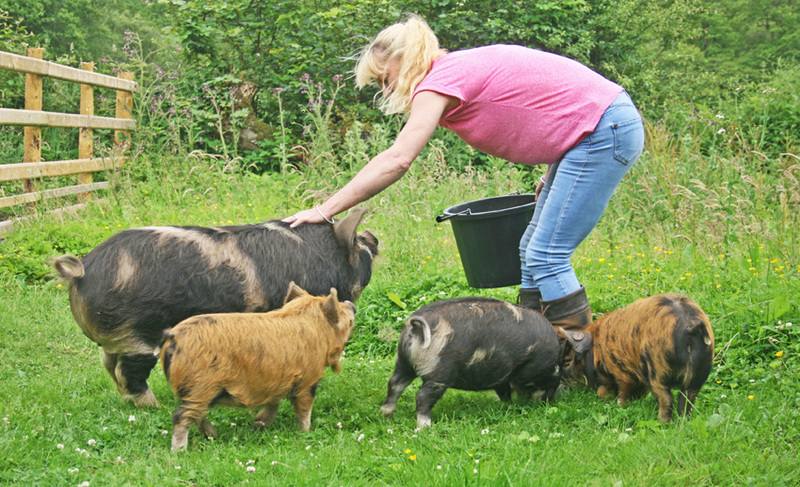 They are just a year old and are half-brothers, coming from a caring home in Kent who were amongst the first people to own this unusual little breed and fell in love with their gentle and usually comic ways. 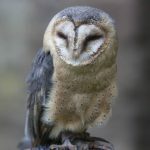 Sarah, their former owner, has been in contact almost daily since their move and watches their progress with interest and pride, as she has been breeding the Minis for over 10 years and is a great source of help and information to keep them safe and healthy. In spite of moving them to Wales in late February as a plan to avoid the Welsh winter, they arrived just in time to be snowed in and quickly got used to wearing tiny rugs and being given warm water alongside their staple food of straw, but were tucked in a large barn so safe and dry. A local appeal for old wellies meant they quickly had fun toys to play with! Snows over, and the lads quickly settled into enjoying walks with us along the scenic ridge by their barn which has panoramic views to both Pen y Fan and the Central Beacons, and also towards the Black Mountain and Carmarthen Fans. You can join us for micro-group walks with these funny little characters, who are now just over a year old and almost fully grown at under 3 ft tall. Watch out for our newest adventure……As part of Visit Wales’ Year of the Sea, we have some special Towpath Walks along the Brecon and Monmouthshire Canal at Pencelli, which includes a stop at The Royal Oak’s beer garden for refreshments for us and the Dinkies. 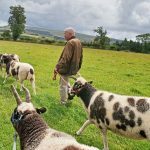 As the creators of Sheep Trekking, we have been taking sheep for a walk in Wales since 2014 and the lovely flock of Jacobs Sheep are now well used to pottering around the drover’s routes on a lead, and people of all ages have enjoyed this curiously mindful experience. However, Nicola noticed that some people were a little wary of the Jacob lads as they are now a fair size, so this year we have two little additions to the fold in the form of two tiny Ouessants which are the smallest naturally occurring breed of sheep. The little guys arrived on the farm in February, and are now enjoying their farm walks, even leading the flock in spite of their little legs. 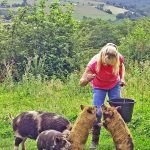 And last but certainly not least, introducing our four little piggies who take micro-groups for walks along the scenic Senni Valley with their handler Helena who lives in this idyllic hidden valley on her smallholding. 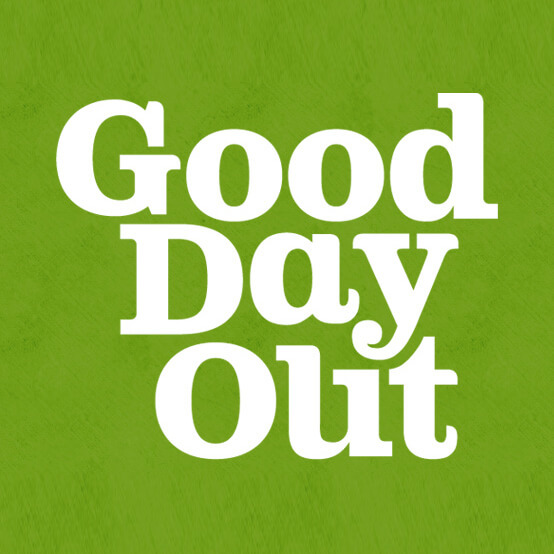 Look forward to welcoming you on a Good Day Out soon!